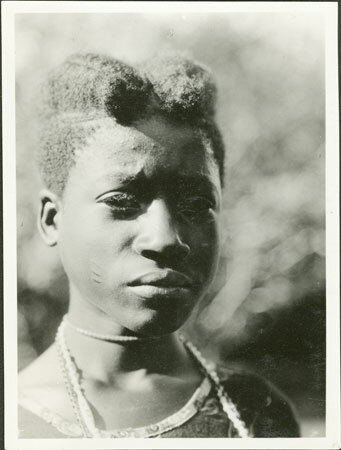 A head and shoulders full face portrait of a girl (identified as Naibani) wearing a dress and neck ornament, her hair styled into two sections on the crown. On her cheek are three short cicatrices. Notes on print/mount - "52/4 +12 EPA 501"
Notes on card mount m/s pencil - "SS lower LHS 8/89"
Morton, Chris. "Portrait of a Zande girl" Southern Sudan Project (in development). 03 Jan. 2006. Pitt Rivers Museum. <http://southernsudan.prm.ox.ac.uk/details/1998.341.501.2/>.